Held quarterly each year in the Fellowship Hall, BPC-K hosts four drives to benefit the American Red Cross (February, May, August & November). At least once a year, BPC-K collects food for Cooperative Christian Ministry. CCM serves the people of Concord, Kannapolis, and Cabarrus County. 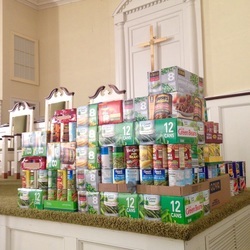 Each summer our congregation participates in the 1,000 Can Challenge to benefit CCM's Summer Food Drive by collecting canned food during June and July. 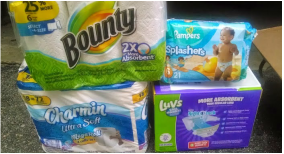 Cabarrus Victims Assistance Network provides safety, shelter and support for battered women and their children in Cabarrus County, N.C. Our congregation supports CVAN with paper products/goods collections --- paper towels, tissues, diapers, cleaning products, etc. BPC-K supports three churchwide Special Offerings of the Presbyterian Church (U.S.A.) These offerings, received each year, are a collective witness to Jesus Christ's love for the whole church. Over the years these offerings have provided ways for individuals and congregations to join together with each other and in partnership with other Christians in responding to a variety of concerns. A gift to One Great Hour of Sharing enables the church to share God's love with our neighbors-in-need around the world by providing relief to those affected by natural disasters (Presbyterian Disaster Assistance), provide food to the hungry (Presbyterian Hunger Program), and helping to empower the poor and oppressed (Self-Development of People.) BPC-K receives this gift during the Easter season. A gift to the Pentecost Offering helps the church encourage, develop, and support its young people, and also address the needs of at-risk children. 40% of this offering received at BPC-K is sent to Children's Hope Alliance. The remaining 60% is used to support ministries of the Presbyterian Mission Agency for ministries with youth and young adults and child advocacy/children at risk. This offering is received on Pentecost Sunday. A gift to the Christmas Joy Offering helps provide financial assistance to current and former church workers and their families, through The Assistance Program of the Board of Pensions, and also enables deserving students to attend Presbyterian-related racial ethnic colleges and schools, through Racial Ethnic Leadership Development. BPC-K receives this offering during the Christmas season.